A quality spa means a quality experience. You get both with a Sundance® Certa™ spa. Superior spa hydrotherapy starts with the soothing sight and sound of the AquaSheer waterfall. Then lean back. The Accu-Ssage™ spa therapy seat reaches the sensitive pressure points in your back, neck and shoulders with a customizable, adjustable-jetHydrotherapy spa. Listen to music while you relax. Built-in micro-speakers are part of the marine-grade BLUEWAVE™ Spa stereo option, which includes Bluetooth® for easy audio streaming, USB power, MP3 jack and FM radio, too. 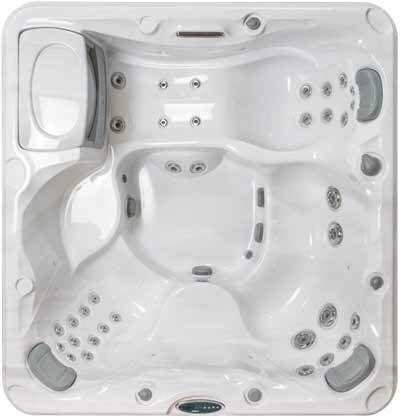 No need to choose between great hydrotherapy and high performance when you're shopping for a hot tub. Choose a Sundance Certa spa and get it all. Dimensions - 6'9" x 7'2" x 36"